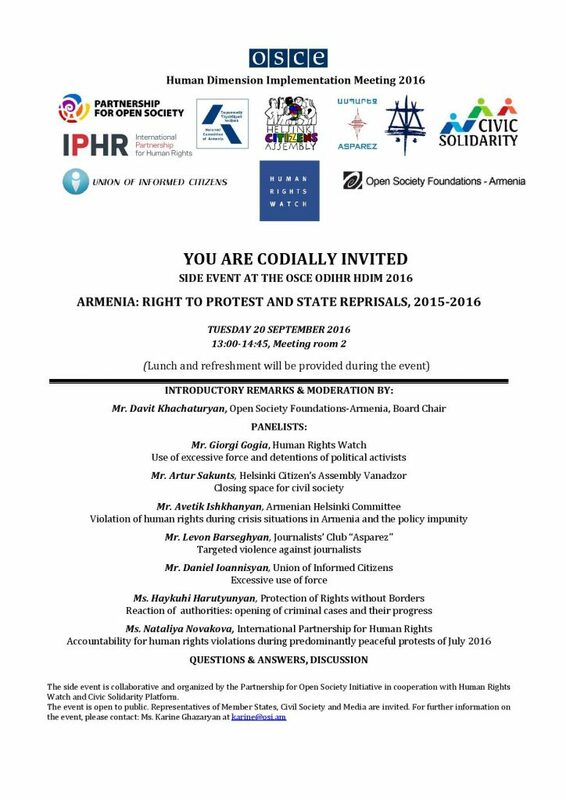 A side event organized by Open Society Foundations Armenia in cooperation with a number of other organizations, including International Partnership for Human Rights (IPHR) and the Civic Solidarity Platform (CSP) at the OSCE Human Dimension Implementation Meeting (HDIM) in Warsaw on 20 September 2016 dealt with the right to protest and state reprisals in Armenia. In the summer of 2015, Armenia police forcefully dispersed the peaceful so-called Electric Yerevan protests held against plans to increase electricity prices and detained over 200 people. This summer predominantly peaceful protests took place in the capital in connection with the seizure of a Erebuni district police station by armed men belonging to the opposition group “Sasna Tsrer”. Also this time, police used excessive force to quell the protests and detained hundreds of protestors. In both cases, IPHR deployed fact-finding missions in the framework of the CSP to investigate the police response to the protests (the 2016 mission is available here and the 2015 mission report here). The speakers at the Warsaw event discussed different aspects of these developments. Avetik Ishkanyan (Armenian Helsinki Committee) described the general human rights context in Armenia, highlighting, among others, the lack of rule of law, selective justice and the failure to hold officials accountable for human rights violations. Giorgi Gogia (Human Rights Watch) and Daniel Ioannisyan (Union of Informed Citizens) both spoke about the use of excessive force by police during the recent protests. Police resorted to force without having exhausted non-violent means and without having made any meaningful attempt to warn protestors. Both police officers and plainclothes individuals were involved in the use of violence against protestors during the 2015 and 2016 events. Levon Barseghyan (Journalists Club “Azparez”) focused on violence targeting journalists and press representatives, saying that available information indicates that attacks on journalists were government-orchestrated both during the 2015 Electric Yerevan events and this year’s protests. Nataliya Novakova (IPHR) summarized key findings of the IPHR-CSP fact-finding mission carried out in connection with the protests in Yerevan this summer. She highlighted concerns about violations of the rights of individuals detained in connection with the protests, such as the failure to explain the reasons for detention, to ensure prompt access to legal assistance, to provide access to required medical assistance, as well as allegations of ill-treatment. Haykuhi Harutyunyan (Protection of Rights Without Border) spoke about the difficulties in providing legal assistance to detained protestors, as well as the lack of effective investigations into the alleged abuses by law enforcement officials.